It will get back to her. Online reporters are already publishing articles about Daisy "shutting down reylo" and people on twitter are @ Rian, Hamill, etc. @Lovely_Rose wrote: Lucasfilm may give us some form of positive marketing if her statement gets too out of hand with the fandom. I doubt they want to isolate Reylo or have this negatively impact people's opinion of it. Pretty sure right now Daisy is panicking and doesn't like her words having this much of an impact. That’s the thing it seems that LucasFilm and Disney never advocate directly for Reylo sadly. to remember no one even cared to ask about Rey and Kylo before TLJ, I think the only time she spoke about them was when she brought it up herself. Yes, but still the Rey & Kylo question doesn't come as often as it should! After the huge development in TLJ you would think the mainstream media would see them as the future romance of this ST, but no, you have reporters like Ash from ET that asks her about a potential love with Poe. Sigh.. It's just frustrating everywhere.. It's like all of us Reylo fans are just crazy people who always see too much into it and JJ decided to just please the fanboys that were disappointed.. You can just tell by the title " The Rise of Skywalker". It's such a fan service thing to put Skywalker in the title. @SkyStar Seriously. It was mostly Rian and sometimes Daisy that would sort of have to force whichever outlet to make a big deal out of it. Even Adam didn't say much. @tukicarreno I agree the title is a bit annoying, and I'm not sure how I feel about Palpatine (at least Kylo's not the big bad) but LF needs attention, multiple people involved (including JJ) have said it's said it's meant to be provocative. Basically, they've accepted that the entire discussion around the ST is controversy, confusion, and division, might as well just own it. Hopefully it gets better later on, as it did with TLJ. They started as the Rey and Luke Show, until it turned into the Rey and Kylo Show. But even now, they're actually being more open about it, and media are voluntarily asking about it. This is leaps and bounds where things were a couple of years ago. I don't remember if this was posted? I have a lot of questions. Did Kelly say "I thought that was a cover story"?. I'm beginning to think they have filmed alternative endings and not even the actors know how it ends. I said this in another forum, but I'll say it here too: this movie almost definitively has third act twists that are big secrets. BIG. As a result, everything that the actors say is going to be cagey/vague, weird, and contradictory. They're also likely having a bit of fun where it's allowed, like alluding to something that we don't realize is a spoiler until later, or after we see the movie (because without context we wouldn't understand what is being talked about). Nikolaj Coster-Waldau (Jaime Lannister, Game of Thrones) did this basically every season because he's a s***-stirrer with a wicked sense of humour. In this case, anything that's going to be controversial, or misdirect, while at the same time poking fun at the audience's ignorance as a result is going to be J.J.'s wheelhouse, honestly. Honestly, the "Daisygate" is just stupid at this point. If you can't read between the line or see the positive in all of this, maybe just take a step back for a while. I listened to the interview and my understanding of what she was trying to explain is that she can't get behind Rey with Kylo. She mentioned the fact that he killed lots of people. Seconds after, she mentioned the redemption part. Are we forgetting that she's been an avid defender of Bendemption? Hours later we get another interview which happened on the same day where she talks about how their relationship will be evolving during episode 9. It sound very good to me. Do not let the haters piss you off. That's what they were waiting for. I bet you most of them didn't even watch the interview. @nickandnora I always think back to how LF, Rian, and the cast managed to hide the force bond and the third act deaths of Snoke and projection Luke, and Kylo becoming SL. They hid Ian McDiarmid being on set. They can hide anything. We really are seeing only a tiny fraction of what this movie will do. @Moonlight13 wrote: I don't remember if this was posted? Well we know Adam wrapped that day, too. Pretty glaring omission from Daisy there. I definitely think she left him out on purpose because if they did film the last scene of the movie on the last day, then it's a pretty huge spoiler if she mentions that Adam was there. Now her seeming to know the ending and the rest of the cast being confused is interesting. They could've filmed a scene or multiple scenes with Daisy and Adam that only they, JJ and a crew member or two would know about. John said he was curious about the title because he knew that there were rewrites throughout filming and that Kylo and Rey had a lot of scenes he wasn't in. He implied that he didn't know the context of said scenes. This is just a theory, but in all likelihood the actors have been working on a "need to know" basis where they were only given the parts of the script that were relevant to them. So, for instance, the actors whose scenes finish "first" in the film wouldn't get the script pages after that if they don't pertain to them. And they've probably even been instructed not to overshare with each other, their fellow castmembers. This is basically what John implied the other day when he said he's not completely sure why the title is "The Rise of Skywalker" because he's not in a lot of the scenes. Edited: Someone beat me to it! I was wondering why Daisy didn’t mention Adam when we know he wrapped the same day as her. But usual Adam is always omitted from everything, it’s like he is not part of the main cast when he is actually one of the co protagonists.. Sigh.. He's a walking spoiler, that's why she didn't mention him. If it’s clear that he was there on the last day, and a known fact that J.J. usually shoots scenes in order, then that’s a give-away that Kylo lives. Which they’re trying to keep secret. It's interesting what she said about the title and Ben: "He is a Skywalker" Finally, someone said it. I’ve now seen several interviews where this seems to be implied like this one for example. John’s choice of words ‘we don’t always know what the narrative is, especially with Rey and scenes we’re not in...’ he does seem a bit put out that he has to figure out the context of the title (just like the rest of us) from scenes he was not party to. I honestly think that only means good things. I know some people are down because of the Daisy interview but we know she's not going to be straight with anything to do with a romance between Rey and Kylo and she did say it was her personal opinion now. Here's the thing, JJ said from as early as 2013 that he wanted a love story. Finnrose was a creation of Rian's and from what I've heard (I couldn't watch the panel) it seems like Finnrose is kind of being put on the backburner. Daisy full out said Rey doesn't have a romance with Finn or Poe. When it comes to talking about Rey having a romance with Kylo, she tends to tiptoe around it. She never outright denies it. JJ will take her thoughts into consideration but if he wants a romance, he'll have one. It's his story, he's the writer, director and producer. I'm sure he'd do it in a way that Daisy is comfortable with though. I guess we'll see but it's not over until the fat lady sings! John is a huge SW fan so he probably feels frustrated about not having the full picture. I can't be mad at him though, especially when he's giving us such amazing soundbites. That Josh dude asked all the right questions! The “its complicated” facebook status reminded me of what Rian said in the directors commentary lol. 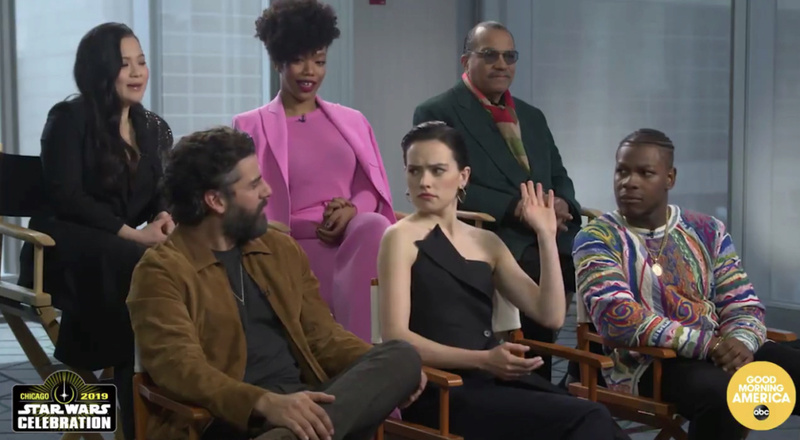 Also the fact that Daisy thought she would be in trouble for answering the Kylo-naked question at Panel is veryyyy telling about how much they can’t reveal, not even a jokey question like that. Also Reylos have been saying Ben IS the Skywalker since trailer dropped, it says a lot about what Reylo’s instantly understand.